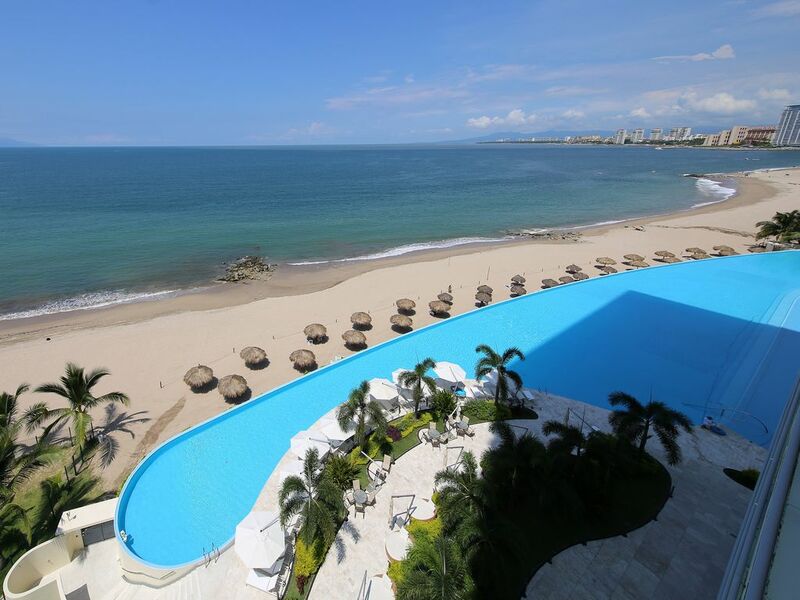 The PENINSULA Condominium is one of the most luxurious condominium in Puerto Vallarta, Mexico. 24 hours security. Peninsula is surrounded by reflection pools giving it the illusion of being on its own island. We're on the 6th floor (equally 8th floor heights), at premium location, corner unit with unobstructed view and biggest infinity pool in Puerto Vallarta. Centrally located, the Peninsula is on the hotel zone, a short walk to La Isla mall; Peninsula Shopping Center, restaurants and Soriana Supermarket. It takes 10 to 15 minutes of taxi to downtown/Old Town, golf, airport, marina,more restaurants, bars, beaches and the Malecon(board walk). This beautiful condo is very spacious home of 3,300 sq. feet that is professional decorated with the contemporary style and some tropical accents. The home has four bed rooms and four bathrooms, a jacuzzi, closets, dresser, and a safe box. The four bedrooms are with 2 kings, 2 queens and 1 full bed with Serta pillow top mattresses. The unit has 4 large balconies wrap around the home with floor to ceiling doors with spectacular ocean, mountain, or city views from almost every rooms in the house. Fully equipped kitchen, the dining area seats 8 comfortably and outdoor dining area with 6 chairs. 3 large flat screen TV's in living room and bedrooms. Cable TV, DVD player, WIFI Internet, and a full-size washer/dryer in the unit. You have all the comforts of home to make your vacation the most memorable and enjoyable. Note: Minimum rental is 6 nights. Please leave a gap of one week between each booking. Thank you. We're a family from Southern California. This property is close to some of Puerto Vallarta's most wonderful attractions, and scenic views. From Crystal beaches to suburban cities, and once you're finished you can go back to our beautiful condo. In there you can find various indoor attractions like a personal movie theater, a spa, or a nice massage. With countless activities this is the place to go. Our home is surrounded with view. We enjoy the sunrise and sunset every day. Our sons like to walk to the beach to play every morning. The staff is very helpful and courteous. Spa inspired shower with Travertine design walls and granite countertops. Full view of beach and Banderas Bay from the living room. Rear bedrooms of the master suite and guest master suite face the Sierra Madre mountains. View of the river from the side of the condo. (5) Two balconies in the living room, two balconies in the master bedroom, and one balcony in the guest master bedroom. In one word? Awesome. I/we have not used VRBO very much but have been the guest of others numerous times, hence I have no reviews other than this. Owners, manager, house keeper were all beyond great. Perfect amount of communication. Condo was far better than even we expected. Can't wait to go back. I had read another review from another Minnesotan that claimed to have a difficult stay. Frankly, I was embarrassed by it. It couldn't have been farther form the truth. Love PV, love The Peninsula. But most importantly, we all loved the condo and everything and everyone involved with it. Thank you very, very much!!!! We were very excited to take our 5 kids and parents on spring break to Puerto Vallarta. After researching on VRBO and other websites we found this condo and were amazed with the pictures and reviews. After a very long day of travel from snowy Minnesota we finally arrived at Peninsula Condo properties. At the security gate we told them our name and the unit we were renting. They had no clue who we were and no paperwork from the condo owner despite me sending it two times to them and receiving a confirmation email. I attempt to call and text the owner Richard, who does not answer, and leave messages of this negligence and why we are not allowed in the property. So there we are the 9 of us hanging out by the front gate in a shuttle exhausted from the days travel. After about 40 minutes they allow us in but we have to sit down stairs with security till Oswaldo, the condo manger, shows up 30 minutes later. When he does arrive he says he was there earlier waiting for us. That is completely false because security would of had our paperwork when we arrived. When we were finally allowed into the condo we were relieved - briefly. The condo itself is fantastic. Plenty of room, nicely decorated and up to date. The views are fantastic from the decks of the ocean, pool, city and mountains. In Richards description of the condo on VRBO he mentions the possibility of loud music front the beach bar across the small river in the evening. Understandable and we were fully aware of that possibility. WHAT HE DID NOT INFORM US WAS OF THE CONSTRUCTION OF “THE CLUB” DIRECTLY BENEATH THE SIDE PATIO OF CONDO 24 HOURS A DAY FOR THE ENTIRE WEEK!!! This is not quiet construction work by any means. Nonstop grinding and cutting of metal and concrete. In our bedroom at night we had the AC running, the ceiling van on, white noise and ear plugs and you could still hear it. They also tested the “clubs” sound system for hours and you could not have a normal conversation in any of the rooms inside the condo. You plan on a quiet relaxing beach vacation and you are completely deceived. I emailed Richard about this and he emails me back saying he was aware of this for over two weeks. Have some respect for your renters and inform us. Allow us to find somewhere else instead of taking our money. He also sends us an email on how expensive electricity is and not to have the patio doors open when the AC is on. Didn’t have to worry about that. Couldn’t keep the patio doors open. On February 5, we emailed you the check-in instruction and we asked you to contact our property manager to arrange the time to meet at the condo. We emailed your check-in document to our manager on March 4. Our property manager did not receive your call until you was already at Peninsula. I returned your call within 30 minutes as the cell phone was in the purse during my wife's haircut. I talked to Peninsula staff and it was resolved. While we understand your frustration, you was shouting at me with the foul languages the minute I called you. It was shocking. We had many families stay during the time of construction. In the past Grand Venetian condo was built right next to us and it was 3-4 years. We didn't aware about this construction until we received a review from a recent guest but he said he loves our condo too much and the construction is small, he still rents knowing it has construction going. You didn't say anything about the construction during the stay until the last day of your trip so we thought you were happy. We're very sorry that you didn't enjoy the trip. Wonderful condo, wonderful owner communication, wonderful complex and ideal location. I've rented dozens of VRBO's all over the world and this experience is in my top 5 all time. The check-in procedure is a little lengthy, but the staff was extremely helpful, and the owners communication was prompt and helpful prior to arrival, during our stay, and through checkout. The unit is straight up gorgeous, and the view is to die for. Every time you walk out from the bedroom to the living room, your jaw will drop. It was 85 degrees during the day each day, but we didn't need the A/C at all. The steady ocean breeze is enough to keep the unit cool all day. May be a different story when it's 95 degrees at 3PM though. The pool is the real draw for this complex, and it's beautiful, clean and too big to ever be crowded (seriously, its HUGE). The complex wasn't crowded at all, so there's no cut-throat resort-style battle royale for palapas on the beach or comfy pool chairs. The in-house restaurant in tower 2 is good enough for when you're lazy, but there are tons of other restaurants close by. The only problem, which is absolutely no fault of the owners, was the constant construction going on right below the unit. 7AM-7PM 5 out of the 6 days we were there. The 6th floor is high enough up where we could close the south door and mostly minimize the noise (was only unbearable when the heavy machinery was running, which was 25% of the time). Whatever they're building isn't very large so it may be done in weeks, not months. If that's the kind of thing that would ruin your trip, ask the owner if it's still going on. I didn't even bring it up to the owners because it wasn't that loud and there wouldn't have been anything they could have done. And it wasn't bad enough that I wouldn't book this condo again, right here and now, knowing construction was still going on. Fabulous stay for a family vacation! Our family absolutely loved this property. There was ample room for the nine of us. The view from this condo is absolutely amazing! The infinity pool was so relaxing and enjoyed by our whole family from our small kids to the grandparents. The owners were so accommodating. They were checking with us throughout our stay to make sure everything was satisfactory. Mr. and Mrs. Wynn contacted us at the end of our stay, asking for any suggestions that we might have to improve the property. We had a few minor things that he was addressing immediately. The other condo owners in this building were also very friendly to us. The security in this building is a high/extreme priority. We would love to return again to the Peninsula!! We stayed for a week between Nov-Dec 2018. All I can say is WOW. This condo was very spacious for our group of 6 and a baby and came very well equipped. The views were amazing and we spent a lot of time relaxing on the deck. Kristal, down in the lobby, was AMAZING. She helped us with all of our adventures. You can parasail right off of this beach, which is what we did. It's in a great location. The boardwalk is a small 10 minute drive. Zip lining about 30 minute drive. Water park about 20 minute drive. It seems to be right in the middle of everything, and it's close to the airport as well. If I were ever to come back, this is where I would stay again. The owners were also very easy to contact. I could call, text or e-mail and they would be there right away for me. I even got a follow up call after my trip to make sure we enjoyed it.I am very impressed with the service I received. We love to have you and your family staying at our condo. We're happy to hear you had great experience even though with your original concern of traveling with young baby. Thank you very much for taking a good care of our home. Richard and Aimee. Richard and Amy were great to work with. We were delighted with the spectacular view. The staff at the Peninsula were extremely helpful. They hailed oversized Taxis for our party of 8. The condo was very large. Tons of dishes, pots and pans for cooking full meals. We hired a cook to make breakfasts. We did have 8 and the dining table only had 7 chairs. We needed to bring in a chair from the patio. Most every one in our group was 6 ft tall or taller, so we found the the living area unable to fit more than 6 people. Again we needed to pull in patio furniture or dining chairs. However this small issue would not stop us from booking again. We love Vallarta which is a safe and hospitable city. Golf, deep sea fishing, jet ski, snorkelling, banana boat, swim with the dolphins, Pirate ship adventure, Sierra Madre expedition, Las Caletas excursion, video casino, night clubs, restaurants, shopping. Cancellation: free cancellation with 60 days prior to arrival date. Christmas holiday week: December 19-December 25, 2019. New Year holiday week: December 26-January 2, 2019. (90 days cancellation is required for holiday weeks). Price for 4 persons, extra charges apply $15-$20 per person per night.